Checking in to a hotel used to feel like a combination of making a bank transaction and ordering cold cuts at a deli counter. At the Westin Southfield Detroit hotel in the Southfield City Centre, the traditional tall, imposing reception desk has been sent to pasture, and has been replaced by four clean, minimalist pods, greatly increasing the personal connection each reception associate can offer guests. It’s kind of like a truly personal welcoming home for friends and family. This reimagined space is just one highlight of the fresh new look at the Westin Southfield Detroit. On April 26, the 12-floor Southfield Town Center hotel opened its doors to city officials, community leaders, first responders, and top customers to celebrate the completion of its $14 million renovation. “Because of its central location, the hotel is appealing to people at companies that do business around the area. The hotel continues to be a landmark here. 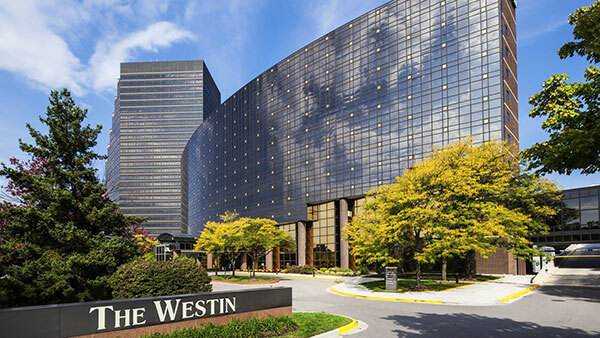 This warranted the reinvestment into the hotel by ownership group Atrium Hospitality,” says Bryan Best, regional director of sales and marketing for the Westin Southfield. Included in the renovation were guest corridors and rooms, plus public and meeting spaces. The hotel has 338 guest rooms and 47,000 square feet of meeting space, the largest of which is the Algonquin Ballroom, which seats 400 for dinner within its 4,628 square feet. “Westin is a lifestyle company that likes to provide natural, uncluttered spaces, with nature brought right into the hotel,” says Best. His favorite update is the “living wall” in the lobby. “It’s a very unique piece, like living art,” he says, adding that it’s a favored selfie spot for guests and wedding parties alike. This art is a great complement to the various art installations strategically scattered around the walkable Southfield City Centre district, offering aesthetically-pleasing experiences from every perspective. Regardless of season, hotel guests, visitors, and tenants of the Town Center buildings can walk through bright, open spaces, indoors and out, says Best. With plenty of amenities within walking distance, guests get the best of a walkable district with a welcoming feel. Guests are also welcome to take advantage of the Zagster bike share program to travel further afield within the City Centre district. Part of the Town Center since 1987, the Westin Southfield Detroit was among the first phases of the then-Prudential Town Center Complex. It was originally a Radisson, and was purchased by Starwood in the late 1990s and unveiled as a Westin. With the extensive renovation, the Westin Southfield Detroit is making a statement that it’s here to stay.